Years ago, when my own son was in elementary school, we’d throw an annual pumpkin carving party at our house for Halloween. It was a hoot. Families would bring their kids and pumpkins. We’d head to the garage and carve the pumpkins this way and that. It’s been a while since we’ve had one of those parties. And now that I’m working for an extra virgin olive oil company, pumpkins bring to mind hearty fall soups and other dishes. Maybe you’re throwing your own pumpkin carving party … or some other Halloween bash. Or maybe you just like pumpkin dishes around now. We’ve compiled half a dozen pumpkin recipes, ranging from rosemary-polenta pumpkin muffins to pumpkin gnocchi. If any family members or friends suffer from gluten intolerance, we’ve dished up a great wheat-free pumpkin chowder (photo above) as well as pumpkin corn muffins. Happy eating … and Happy Halloween! This bread, baked with extra virgin olive oil instead of butter, has received the thumbs up from an eight-year-old “recipe tester” who works in the informal test kitchen we operate at California Olive Ranch. Our Facebook fans like it, too. “It was really good—very moist. I will definitely make it again!” one fan wrote on our wall. The bread has a sweet crumb, or streusel, topping. Adventuresome types can dive into this recipe and make their own gnocchi. The recipe is from Chef Ray Garcia, who leads the kitchen at Santa Monica’s FIG Restaurant. It’s a seasonal bistro that specializes in locally grown and organically sourced ingredients. Karina Allrich is the creative force behind the gluten-free goddess blog, which features amazing gluten-free dishes. Karina suffers from a digestive condition known as celiac disease. She must avoid everything from breads made from white and whole wheat flours to pasta, beer and bagels. But that’s inspired her to create incredible dishes without wheat. This seasonal soup, pictured above, also is dairy-free and so perfect for vegan diners. Yet another recipe from Karina Allrich and her gluten-free goddess blog. 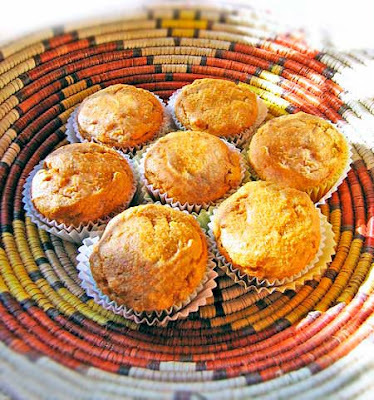 She describes these muffins as “tender and not-too-sweet.” And they reheat well. 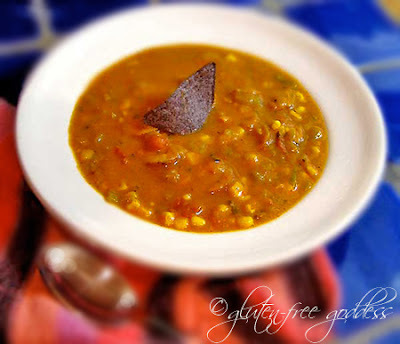 “I halved and toasted mine in the toaster oven for a brunchy bite with green chile stew,” Karina says. The recipe calls for a gluten-free baking and pancake mix which you can purchase. Olive oil expert Fran Gage developed this focaccia. The pumpkin seeds and thyme are mixed into the dough. One of her favorite bakeries makes loaves of bread studded with pumpkin seeds. “It was an inspiration for this focaccia,” Gage writes in her excellent book The New American Olive Oil (Stewart, Tabori & Chang, 2009), where this recipe appears.